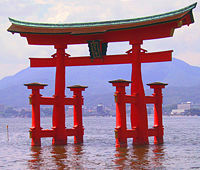 Shinto (Kanji: 神道 Shintō) (sometimes called Shintoism) is a native religion of Japan and was once its state religion. It involves the worship of kami, which can be translated to mean "sacred spirits which take the form of things and concepts important to life, such as wind, rain, mountains, trees, rivers and fertility." Some kami are local and can be regarded as the spirit or genius of a particular place, but others represent major natural objects and processes, for example, Amaterasu, the Sun Goddess. The word Shinto was created by combining two kanji: "神" shin, meaning gods or spirits (the character can also be read as "kami" in Japanese), and "道" tō meaning “way” or “path” (the same character is used for the Chinese word Dao). As such, Shinto is commonly translated as "the Way of the Gods." 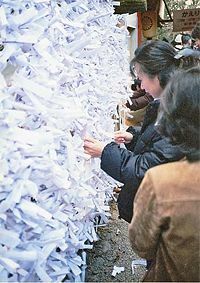 After World War II, Shinto lost its status of state religion; some Shinto practices and teachings, once given a great deal of prominence, are no longer taught nor practiced today, and others remain largely as everyday activities, like omikuji (a form of drawing lots), visitation to the shrine celebrating the New Year, and customary purification rituals. Archeological evidences indicates that Stone Age people lived in the Japanese Archipelago between 33,000 and 21,000 years ago during the Paleolithic period. Japan was then connected to mainland Asia by land bridges, and nomadic hunter-gatherers crossed over from the Korean Peninsula and Siberia. They left flint tools, but no evidence of permanent settlements. On the Japanese islands there were various natural phenomena, such as volcanic activity, severe earthquakes, and major typhoons. These natural forces were named mono. Gradually it was conceived that there were spiritual beings, called kami, behind these natural forces. Some historians maintain that these beliefs in spiritual beings developed during the Yayoi (800 B.C.E. - 300 C.E.) period because immigrants from China and Korea brought agricultural rites (centered upon the cultivation of rice) and shamanic ceremonies from the continent. These took on Japanese forms in the new environment. The inhabitants of Japan started to be conscious of their ancestors’ spirits, named tama, as spiritual beings who could influence the prosperity and productivity of their communities. The mono was a being with no personality, expressed in mere natural forces, but tama and kami were beings with some kind of personality or human-like characteristics. Eventually tama and kami became enshrined for worship by people who expected them to control natural circumstances and protect their lives. Shinto is commonly translated as "the Way of the Gods"
Gradually these enshrined tama and kami came to be regarded as “gods” or “deities” with stronger and clearer personalities. These religious forms can be called a primitive or early religion. Primitive religions can be classified in two groups. One is Animatism, religion worshiping the power of beings without personality. The other is Animism, a religion with spiritual beings that have human-like personalities. According to this classification, the worship of mono is Animatism and the worship of tama and kami is Animism. Many religious styles of Animatism and Animism can be observed all over the world. In order to grasp the character of the indigenous religious beliefs and practices of Japan, we should first understand that there is a continuation of the concept of tama and kami, even though these terms changed to “gods” or “deities.” These mixed religious concepts are the original religion of Japan. Shinto's kami are collectively called Yaoyorozu no Kami (八百万の神), a traditional expression literally meaning "eight million kami." The arcane name of eight million, Yaoyorozu, is not an exact number, but an expression indicating that there is a great variety of polytheistic forms. These gods were the figures that Animistic beings had been having stronger and clear personalities. During the early Nara period, the Kojiki (712 C.E.) and the Nihonshoki (The Chronicles of Japan, 720 C.E.) were written by compiling existing myths and legends into unified accounts. Kojiki, the older text, focused on establishing the identity of the Imperial family as descendants of a divine being. Kojiki, together with Nihonshoki, became a primary sacred text of Shintoism. In Kojiki one can see the process of the creation of the nation and the genealogy of gods. There were descriptions of the god of the mountain and the god of the fields. The god of the mountain was named oyamatsumi no kami and the god of the fields was named kayanohime gami. This shows that the Animistic kami had evolved into gods with names who had clearer and stronger personalities. The period during which the kami emerged as “gods” coincided with the appearance of the first nation of Japan, ruled by an emperor. Around this time, in each rice-cultivating agricultural community, agricultural rites were celebrated seasonally and communal religious activities were performed centered upon kami-nature. Gradually each kami was associated with local ruling clan (uji) and the kami was named ujigami (kami of clan). The leaders of the strongest clan in the Yamato region (near present-day Nara) came to be regarded as descendants of the chief kami, the Sun Goddess Amaterasu. She was born from the left eye of Izanagi as he purified himself in a river, and went on to become the ruler of the Higher Celestial Plane (Takamagahara). She was also considered to be directly linked in lineage to the Imperial Household of Japan and the Emperor, who were considered descendants of the Kami themselves. As a descendant of Amaterasu, Jimmu Tenno, became the first emperor. In 538 C.E. Buddhism was introduced into Japan. Many Yamato courtiers accepted Buddhism, although in a Shintoistic way, worshipping the Buddha and the sutras as a kind of being like kami. Though clan rivalry led to friction and fighting during the introduction of Buddhism, the worship of kami and the teachings of the Buddha soon settled into coexistence. In fact, syncretism between Buddhism and Shinto (神仏集合, shinbutsushūgō, Shinto-Buddhism synthesis) was to become the dominant feature of Japanese religion as a whole. In 592 C.E. Prince Shotoku declared Buddhism the official religion of the Imperial Court. However, Shintoism and Buddhism continued to coexist among the general Japanese population. With Buddhism, which possessed highly logical and systematic doctrines, as a catalyst, Shinto began to clarify its own identity. Shinbutsu Shugo (神仏習合; the kanji stands for “Shinto, Buddhism, learn, join together”) is called the Japanese fusion of Buddhism and Shinto. Temples were attached to many shrines and became devoted to both Shinto deities and Buddha. Hachiman (Japanese, 八幡神 –shin; also can be read as Yawata no kami) is the Shinto god of war, and divine protector of Japan and the Japanese people. The name means “god of eight banderoles.” His symbolic animal and messenger is the dove. From ancient times Hachiman had been worshipped by peasants as the god of agriculture and by fishermen who hoped he would fill their nets with fish. In the Shinto religion, he became identified by legend as the deified Emperor Ōjin, son of Empress Consort Jingū, from the third - fourth century C.E.. However, after the arrival of Buddhism in Japan, Hachiman became a syncretistic deity, a harmonization of the native Shinto religion with Buddhism. In the Buddhist pantheon during the eighth century C.E., he became associated with the great bodhisattva Daibosatsu. During the eighth century C.E. (the beginning of the Heian era), the theory of “Honchi Suijyaku” emerged. This theory explained that the Shinto gods were merely manifestations (gongen) of Buddha and Bodhisattva. Conversely, during the Kamakura era (1192-1336 C.E. ), a theory emerged that Buddha was merely a manifestation of Shinto’s kami. One explanation saw the Japanese kami as supernatural beings still caught in the cycle of birth and rebirth. The kami are born, live, die, and are reborn like all other beings in the karmic cycle. However, the kami played a special role in protecting Buddhism and allowing its teachings of compassion to flourish. This explanation was later challenged by Kukai, who saw the kami as different embodiments of the Buddhas themselves. For example, he famously linked Amaterasu, Sun Goddess and ancestor of the Imperial family, with Dainichi Nyorai, a central manifestation of the Buddha, whose name is literally "Great Sun Buddha." In his view, the kami were just Buddhas by another name. Buddhism and Shinto coexisted and were amalgamated in the Shinbutsu Shugo, and Kukai's syncretic view held wide sway up until the end of the Edo period. At that time, there was a renewed interest in "Japanese studies" (Kokugaku), perhaps as a result of the closed country policy. During the eighteenth century C.E., various Japanese scholars, in particular Motoori Norinaga (1730–1801), led a revival of interest in the Kojiki, the Nihonshoki and other ancient Shinto texts, and tried to separate the "real" Shinto from various foreign influences. Following the Meiji Restoration, Shinto was made the official religion of Japan, and in 1868 its combination with Buddhism was outlawed. During this period, numerous scholars of Kokugaku felt that Shinto was needed in order to unify the country around the emperor, as the process of modernization was undertaken with all possible speed. The psychological shock of the Western black ships and the subsequent collapse of the shogunate convinced many that the nation needed to band together if it was going to resist being colonized by outside forces. As a result, Shinto was used as a tool for promoting emperor (and empire) worship, and Shinto was exported into conquered territories like Hokkaido and Korea. 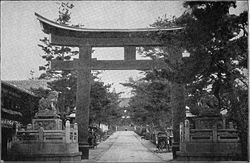 In 1871, a Ministry of Divinities was formed and Shinto shrines were divided into twelve levels with the Ise Shrine (dedicated to Amaterasu, and thus symbolic of the legitimacy of the Imperial family) at the peak and the small sanctuaries of humble towns at the base. The following year, the ministry was replaced with a new Ministry of Religion, charged with leading instruction in shushin (“moral courses”). This was a major reverse from the Edo period, in which families were registered with Buddhist temples, rather than Shinto shrines. Priests were officially nominated and organized by the state, and they instructed the youth in a form of Shinto theology based on the official history of the divinity of Japan's national origins and its Emperor. Children were taught in school that the Emperor was a direct descendant of Amaterasu, the Sun Goddess, and that that the nation’s history began in 660 B.C.E. with the legendary Emperor Jimmu Tenno. As time went on, Shinto was increasingly used in the advertisement of nationalists' popular sentiments. The Imperial Rescript on Education (教育勅語 Kyôiku Chokugo) was signed by Emperor Meiji of Japan on October 30, 1890. It was distributed to every school in the Japanese Empire, along with a portrait of the emperor that was to be kept hidden from view. The Rescript pushed traditional ideals of Confucianism, and students were required to ritually recite its oath to "offer yourselves courageously to the State" as well as to protect the Imperial family. The practice of emperor warship was also further spread by distributing imperial portraits for esoteric veneration. All of these practices were used to fortify national solidarity through patriotic centralized observances at shrines. This use of Shinto gave Japanese patriotism a special tint of mysticism and cultural introversion, which became more pronounced as time went on. This process continued until the Showa Period, before coming to an abrupt halt in August 1945. The era of State Shinto came to an abrupt close with the end of World War II. It appeared that the kami had failed to provide a Divine Wind (kamikaze) to turn back the foreign invaders. Soon after the war, the Emperor issued a statement renouncing his claims to the status of "living god." During the post-war period, numerous new religions cropped up, many of them ostensibly based on Shinto, but on the whole, Japanese religiosity may have declined. The concept of religion in Japan is a complex one. A survey conducted in the mid-1970s indicated that of those participants who claimed not to believe in religion, one-third had a Buddhist or Shinto altar in their home, and about one quarter carried an o-mamori (an amulet to gain protection by kami) on their person (o-mamori are sacred talismans used to contain prayers and invocations that ensure the wearer’s general good fortune). 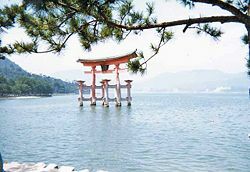 Following World War II, Shinto has, for the most part, persisted with less importance placed on mythology and the divine mandate of the Imperial family. Instead, shrines tend to focus on helping ordinary people gain better fortune for themselves through maintaining good relations with their ancestors and other kami. Post-war, the number of Japanese citizens identifying their religious beliefs as Shinto has declined considerably, yet the general practice of Shinto rituals has not decreased. Many practices have persisted as general cultural beliefs (such as ancestor worship, which is still very popular), superstitions, and community festivals (祭, matsuri), focusing more on religious practices and items than principles. By far the important Shinto ritual is the annual local matsuri, held in almost every town and village centered on the local shrine to the Shinto kami. The explanation generally given for this anomaly is that, following the demise of State Shinto, Shinto has reverted to its more traditional position as a folk religion which is culturally ingrained, rather than enforced. In any case, Shinto and its values continue to be an important component of the Japanese cultural mindset. In order to distinguish between the different points of emphasis within Shinto, many feel it is important to separate Shinto into four related types of Shinto expression. Shrine Shinto is the oldest and most prevalent of the Shinto types. It has always been a part of Japan's history and constitutes the main current of Shinto tradition. Sect Shinto is comprised of thirteen groups formed during the nineteenth century. They do not have shrines, but conduct religious activities in meeting halls. Shinto sects include the mountain-worship sects, who focus on worshiping mountains like Mt. Fuji, faith-healing sects, purification sects, Confucian sects, and Revival Shinto sects. Konkokyo, Tenrikyo, Kurozumikyo, although operating separately from modern Shinto, are considered to be a form of Sect Shinto. Folk Shinto includes the numerous but fragmented folk beliefs in deities and spirits. Practices include divination, spirit possession, and shamanic healing. Some of these practices come from Taoism, Buddhism, or Confucianism, and some come from ancient local traditions. State Shinto was the result of the Meiji dynasty's restoration and the downfall of the shogunate. The Meiji attempted to purify Shinto by abolishing many Buddhist and Confucian ideals; also, the Emperor was once again considered divine. After Japan's defeat in World War II, State Shinto was abolished and the emperor was forced to renounce his divine right. One of the most important moral and ethical traditions propagated by Shinto is that group solidarity takes precedence over individual behavior. Many people are apt to think that the Japanese rely solely on Buddhist teachings for their ethical and moral codes, but rigorous examination shows that this is not true. An essential point of Shinto is the idea that wa (kind, benign and harmless harmony) is inherent in nature and social relationships. This value existed in Japan before the arrival of Buddhism. Some scholars believe that the Japanese belief that the individual is less important than the group is a result of the culture of rice cultivations that was brought from the continent during the Yayoi period (ca. 800 B.C.E.-300 C.E.). While agricultural societies were being established in the several locations, primitive religions became a primitive form of Shinto, center on the rites of agriculture and rice cultivation. Relationships of mutual assistance, harmony and good understanding were crucial for the cultivation of rice. The highest moral and ethical behaviors gave priority to the survival of the agricultural community. There are many agricultural societies in Asia, but in the case of Japanese rice cultivators, society was deeply connected to religious rites. The concept of kami arose in the Japanese agricultural society from the need for protection and prosperity. Throughout Japanese history, until the present, Shinto rites are mostly connected with rice cultivation. The “Niname Rice Harvest Festival” was the most important Shinto festival. During the period of the ancient nation state, according to Nihonshoki, a Niname Festival was conducted by the first Emperor Jimmu, who performed a ceremony for the pacification of spirits on the previous night. Until the present time, the Emperor’s family has continued to conduct this annual ceremony. Shinto is such an ancient tradition that its shrines (jinja) reflect the natural landscape. The earliest jinja were a simple carved rock or a tree. As time passed, the sacred areas were enclosed, and buildings resembling the store houses of the Yayoi culture (ca. 800 B.C.E.- 300 C.E.) were constructed. Many of the enclosed shrines were used for the veneration of rice deities. Two of the most ancient Shinto shrines are the shrines of Ise and Izumo. Ise Shrine is dedicated to the Sun Goddess Amaterasu. Izumo Shrine is for the worship of the “Great Lord of the Country,” Okuninushi. Unlike many religions, one does not need to publicly profess belief in Shinto to be a Shintoist. Whenever a child is born in Japan, a local jinja adds the child's name to a list kept at the shrine and declares him or her ujiko, literally “named child.” After death, an ujiko becomes an ujigami; literally, “named kami.” One may choose to have one's name added to another list when moving and then be listed at both places. Names can be added to the list without consent and regardless of the beliefs of the person added to the list. However, this is not considered an imposition of belief, but a sign of the welcome of the area kami, with the promise of addition to the pantheon of kami in the afterlife. Those children who die before addition to the list are called mizuko, literally “water child,” and believed to cause troubles and plagues. Mizuko are often worshiped in a Shinto shrine dedicated to stilling their anger and sadness. These shrines have become more popular with the growth of abortion in modern Japan. Early ceremonies are thought to have been held outside before trees or sacred rocks (iwakura). There was no representation of the kami, for they were conceived as formless and pure. After the arrival of Buddhism in the sixth century, the idea of building 'houses' for the kami arose and shrines were built for the first time. The earliest examples are thought to have been at Izumo (659 C.E.) and Ise (690 C.E.). For the spouses to retire within. The number eight is a reference to the eight islands of Japan named in ancient chronicles. The Izumo Shrine is still enclosed by a fence beyond which mortals may not pass. On the outside of every Shinto shrine are several classic Shinto gates called torii, which stand alone. These gates, found at every Shinto temple, are unconnected to any fence or wall, and symbolize the separation between the “inner” sanctuary and the “outer” secular world. Passing through them is a rite of purification. After passing under the gates, the worshipper usually enters a public worship hall and then an inner sanctuary where the priests make offerings to the gods. The kami are enshrined in a small cabinet in the sanctuary. Worshippers clap three times, pray and toss a donation into an offering box. The principal worship of kami is performed at public shrines, although worship at small private shrines in the home (sometimes only a high shelf with a few ritual objects) is also common. It is also possible to worship objects or people while they exist. While a few public shrines are elaborate structures, most are small buildings in the characteristic Japanese architectural style. There are well over 100,000 of these shrines in operation today, each with its retinue of Shinto priests. The main sanctuary is called a honden. Some shrines, such as those that have a mountain or other large natural object for a center of worship, have no sanctuary at all, just a pavilion where the worshipper can stand and gaze at it. Shinto priests often wear a ceremonial robe called a jo-e. Kami are invoked at such important ceremonies as weddings and entry into a university. The kami are commonly petitioned for earthly benefits, such as a child, a promotion, or a happier life. While one may wish ill fortune on others, this is believed to be possible only if the target has first committed a wrong, or if one is willing to offer one's life. Shinto is popular for the occasions of daily life, but when it comes to funerals most Japanese turn to Buddhist ceremonies, since the emphasis in Shinto is on this life and not the next. Shinto teaches that certain deeds create a kind of ritual impurity that needs to cleansed, not because it is wrong, but for one's own peace of mind and good fortune. Wrong deeds are called kegare (literally, “dirtiness”), as opposed to kiyome (purity). Normal days are called ke (day), and festive days are called hare (sunny, or simply good). The killing of living beings should be done with reverence and the attitude of taking a life in order to continue one's own. Modern Japanese continue to place great emphasis on the importance of aisatsu, or ritual phrases and greetings. Before eating, most (though not all) Japanese say itadakimasu (“I will humbly receive this food”) in order to show proper thankfulness to the preparer of the meal in particular and more generally to all those living things that lost their lives to make the meal. Failure to show proper respect can be seen as a lack of concern for others, looked down on because it is believed to create problems for all. Those who fail to take into account the feelings of other people and kami will only bring ruin on them. The worst expression of such an attitude is the taking of another's life for personal advancement or enjoyment. Those killed without being shown gratitude for their sacrifice will hold urami (a grudge) and become aragami, a powerful and evil kami that seeks revenge. This same emphasis on the need for cooperation and collaboration can be seen throughout Japanese culture today. Purification rites are a vital part of Shinto. These may serve to placate any restive kami, for instance when their shrine had to be relocated. Such ceremonies have also been adapted to modern life. For example, a ceremony was held in 1969 to hallow the Apollo 11 mission to the moon, new buildings made in Japan are frequently blessed by a Shinto priest during the groundbreaking ceremony, and many cars made in Japan have been blessed as part of the assembly process. A more personal purification rite is the purification by water. This may involve standing beneath a waterfall or performing ritual ablutions in a river-mouth or in the sea. These two forms of purification are often referred to as harae (祓). A third form of purification is avoidance, that is, the taboo placed on certain persons or acts. For example, women were not allowed to climb Mount Fuji until 1868, in the era of the Meiji Restoration. Although this aspect has decreased in recent years, religious Japanese will not use an inauspicious word like “cut” at a wedding, nor will they attend a wedding if they have recently been bereaved. In medieval times, wealthy people would donate horses to shrines, especially when making a request of the god of the shrine (for example, when praying for victory in battle). For smaller favors, giving a picture of a horse became customary, and these ema (絵馬, “picture horse”) are popular today. The visitor to a shrine purchases a wooden tablet with a likeness of a horse, or nowadays, something else (a snake, an arrow, even a portrait of Thomas Edison), writes a wish or prayer on the tablet, and hangs it at the shrine. 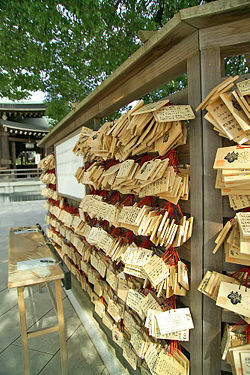 In some cases, if the wish comes true, the person hangs another ema at the shrine in gratitude. Many Japanese practices have origins either directly or indirectly rooted in Shinto. For example, it is clear that the Shinto ideal of harmony with nature underlies such typically Japanese arts as flower arranging (ikebana), paper-folding (origami), and traditional Japanese architecture and garden design. A link to Shinto is seen in sumo wrestling, where, even in the modern version of the sport, many Shinto-inspired ceremonies are performed before a bout, such as purifying the wrestling arena by sprinkling it with salt. The Japanese emphasis on proper greetings and respectful phrasings can be seen as a continuation of the ancient Shinto belief in kotodama (“words spirit,” words with a magical effect on the world). Littleton, C. Scott. Shinto: Origins, Rituals, Festivals, Spirits, Sacred Places. Oxford University Press, 2002. ISBN 0195218868. Ueda, Kenji. "The Concept of Kami." In John Ross Carter (ed. ), The Religious Heritage of Japan: Foundations for Cross-Cultural Understanding in a Religiously Plural World, pp. 65-72. Book East, 1999.